Placencia, Belize expat Gary Peterson talks about how education in Belize fails regular Belizeans and the lack of opportunities for people to get ahead. I have lived full-time in Belize for three years. During that time I built a house, allowing me to watch and learn about the work ethic and culture here. I became friends with one or two of workers who built my house and after completion have tried to find odd jobs for them to supplement their incomes. These guys work long hours in the heat, from daybreak until late afternoon, with a couple days off every 8-10 days. One particular young man acted as my foreman for my Belizean builder and knows everything there is to know about construction around here. I’ve hired him for multiple projects after my build was complete and met his family. He has worked hard these past few years, putting his wife through school to become a chef which she now is, working at the fantastic Rumfish restaurant in Placencia. One day he told me about his dream to break away from his employer and start his own construction company. I asked him how much he knew about starting a business, doing a business plan, financing, contractor’s license, creating a quote/contractor pricing, and his profit margins. He said he can build a house, but doesn‘t know how to do the rest. In the public school system in Belize, there is no access or training available to youngsters on a computer. They can all use a cell phone, but computer skills are pretty much nonexistent. This young man has virtually no path to become a builder/contractor in Belize unless he finds a place to pay for training and an actual contractors school. If he wants to go to architecture school, he will need to go abroad, because there are none in Belize. With the low pay scale for workers and the cost of living for families, this will be all but impossible for this young man to achieve. This is a story told over and over here where there is a need and desire to advance in any profession, but little help from the government. There is no such thing as Small Business Development for the average citizen where they can get ahead. There are however lots of jobs in the construction and service industries because Belize runs on the tourism. But many Belizeans feel they can’t get ahead, will always have to work for a foreign investor, and can never own and operate their own business. There are exceptions to the rule, but that’s usually because of Belizean families that have built a sweet bank account, by selling off property, or inheritance, or whatever. What I see are expats in Belize and foreign vacationers doing their best to help financially when they can. Our local chapter of Rotary runs raffles and programs for the youth here in Belize, primarily to assist in paying for their schooling. Parents here must provide uniforms and all school supplies for their children, or they can’t attend. The school system in Belize does its best to give these children an education, but it’s not even close to the basic education children have in the US or Canada. In a nutshell, it’s a merit-based school system, where if the child shows through grade average he is working hard; the government will pay a larger portion. This is where the Rotary comes in with supplement payments and grants to older kids already out of school. Many drop out when they can, to support the family, like it was back in my grandparents’ day in the U.S. 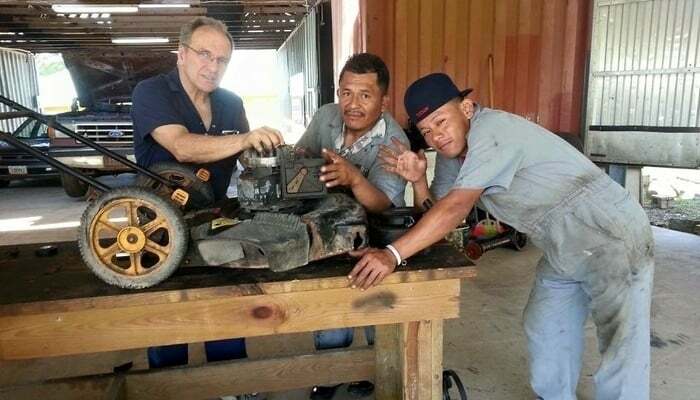 The Rotary recently offered seven male teens over 18 years old a chance to learn a trade. The program, called Trades 4 Life, offered them three months at school, learning skills like welding, machining, mechanics, refrigeration/air-conditioning, and computer technology. The Rotary paid for transportation, housing, food and supplies, and the classes themselves. Part of the application process – and mandatory – was the ability to read and write. Regretfully we denied a few applicants that wanted to enroll in this program because they could not read and write. The school system in Belize is for children to graduate from a high school level, but some who graduate still cannot read or write sufficiently. Amazingly the Rotary had trouble filling all the positions. The reason? In this age bracket, they may want to learn a trade, but they also need to work to support the family. They could not afford to take 90 days out of that equation. Another factor for not filling the positions is communication where these prospects could learn about this program and apply. For instance, mostly, the only Belizeans on social media are those that already have a job. The ones that learned about it had issues even filling out applications, and the Rotary couldn’t contact them to follow up. These issues sum up the problems facing those trying to get ahread in Belize. It‘s a vicious circle where those most needing practical help are the most unable to accept it and those who can accept help are the ones who least need it. The solution comes back to education education education for everyone. But unfortunately Belize is a long way from providing the opportunities that its most needy citizens require. In the meantime I hope that those of us here who can help do what we can in order to help our Belizean friends to get ahead.